Content is key for any directory, and the one you create using this WP Directory theme won’t be any different. Price packages are designed to offer as many possibilities as possible both to you (the admin) and the visitors submitting a post. Here are three things you should know about price packages. Pay-per-post packages require the visitors to pay during each post submission. Pay-per-subscription packages allow you to set the timeframe in which posts can be submitted as well as a maximum number of listings. Subscription price packages work great in conjunction with recurring PayPal payments. Changing colors is as simple as using a color picker. The fact everything is in real-time will allow you to quickly see what works and what doesn’t. One of the ways you can charge extra for a particular post submission is to set a featured price. Featured prices can be set for both the homepage and category page (different price for each). Featured posts show with a specific label and are stacked at the top of listing pages. Another way to charge extra is to set category prices. This feature allows you to define exactly which custom fields show for each price package. You can also control the number of allowed images and stuff like character count for text fields. 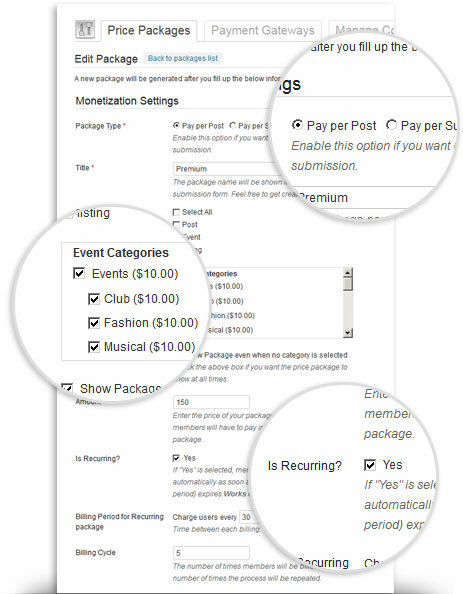 In practice, this will allow you to provide additional options (input fields) within the more expensive price packages. Create amount based or percentage based coupons and offer discounts on price packages. Set a start/end date for coupons and don’t worry about expiry dates. Set the currency ISO code, the symbol and even the position (before/after amount). There are virtually no limitations here. Directory comes preinstalled with PayPal and PreBank transfer methods. There are dozens more available optional payment processors. All payments can be reviewed and approved/denied in the back-end. There are also several dashboard widgets? you can use to keep track of transactions. Search through submitted transactions using multiple filtering fields such as date, package type, post type, etc. Export results to a .CSV file.